Much as we love trying new things, we keep coming back to Chicken Tikka Masala. Voted the nation’s favourite and, once, even Britain’s national dish, this quick recipe will have you rustling up a knockout one in a flash. We’ve added a couple of little extras into this recipe to make the taste sharper, but our sauce works great on its own if you prefer. A rich, creamy tomato sauce with hints of cumin & coriander. Heat the vegetable oil in a pan and add the red onions or shallots. After 2 minutes add the chicken and allow to seal for a few minutes. 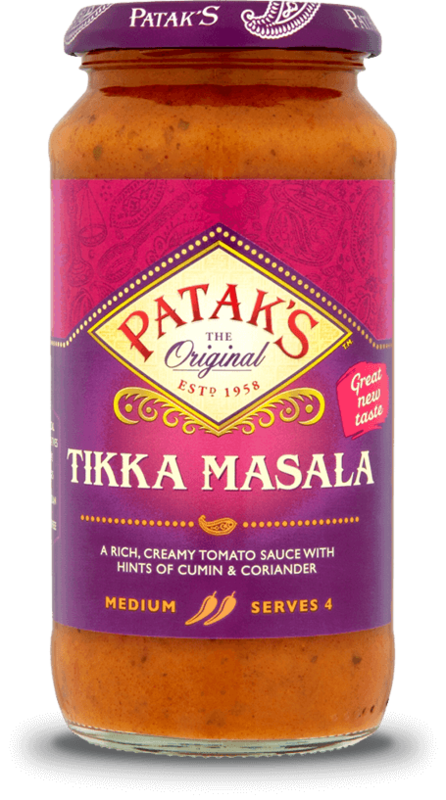 Add the tomatoes and the Patak’s Tikka Masala Cooking Sauce. Cover and leave to cook through for 15 minutes. Stir occasionally to prevent the Tikka Masala from sticking to the bottom of the pan. Taste and adjust the seasoning with salt, sugar and lemon juice. Sprinkle over the coriander and serve simply with fresh hot basmati rice. Popular in all regions of India and a stalwart of Indian cuisine in the UK, the Pappadum is a delicious traditional crispy snack that is served either as an appetiser or with a main meal. Our Pappadums have a real authentic taste to them. All you need is to microwave or fry and serve up with dips or a curry. Our unique recipe with kalonji seeds is flame-baked in a tandoori-style oven to create a delicious naan. Perfect for dipping into our delicious curries or serving with our chutneys and pickles to help create the perfect curry night in. Our mild mango chutney is a delicious blend of juicy mangoes with cumin & coriander. Perfect with pappadums, as a curry side or with sandwiches and cheese. Enjoy! For a Tikka Masala for two that’s just a little bit special, try this recipe using one of our Tikka Masala Paste Pots with a touch of ginger, garlic, honey and fresh coriander.